Seas parting to let humans pass through. Fire falling from the sky. A dead man coming back to life. Miracles. The Bible tells about such happenings, and we see them as interventions from God, demonstrations of His power over all of creation, and proof of His sovereignty. We are awed by them. But the skeptic will see things differently. He will scoff and laugh it all off as myth, as something belonging with the league of fairytales. In his book Miracles, C.S. Lewis challenges the disbelieving attitude to miracles put up by many of the intellectual type and much of the modern world. He tackles the widely held notion that supernatural occurrences are impossible, and establishes that the basis for such skepticism is not a deep knowledge of science and the laws of nature, but on a misconception of the basic ideas that underpin our understanding of nature and its workings. Rather than dive straight into proposing reasons for believing in miracles, Lewis starts off by addressing the worldview held by the unbeliever. This worldview, he says, is what gives rise to the idea in the mind of the skeptic that miracles don’t happen. He identifies this as naturalism, a basic belief that the physical world is all that there is- as opposed to supernaturalism, which argues for the role of causes other than factors in the natural world (such as a God). But then he points out that naturalism, which doesn’t allow for a God to have His say in the natural world’s workings, is a faulty way of looking at existence. Naturalism tell us that physical causes lead to physical effects, but it doesn’t help us capture those events in communicable ways, or explain why we can even think about such processes rationally. In short, he says, naturalism cannot tell us why rational thought is possible, since it only proposes material things as causes- and the mind, which thinks, is not physical. Consciousness, Lewis asserts, must have an origin that is ‘out of this world’. 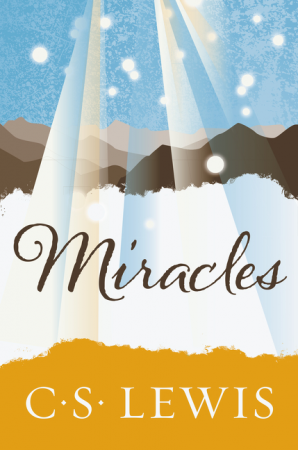 Lewis’ argument from reason helps prepare the ground for a detailed examination of the objections to miracles often cited by those who do not believe. He makes the interesting point that miracles aren’t necessarily “violations” of the laws of nature; they are uncommon events which are traceable to a divine agent, but are also explainable as occurrences that happen through natural processes. He says that miracles give the impression that the natural world can, and occasionally is, “tampered with” (by a divine will), so that outcomes in those instances seem to be glaringly unlike what we would expect from nature operating as usual. Miracles has a lot in it for anyone who is searching for arguments in favour of believing in the supernatural. It can also serve as a great gift to a skeptic friend; it could set them on the path to thinking differently not just about miracles, but about their worldview, and the possibility that they could be better off having faith in God and in His goodness.